Wow, I don’t make a consistent blogger… there is just too much to do in my life. Alright, so I was going to document my Zeal Wellness 30 day challenge, but this product gave me so much energy and clear mindedness that I ended up being too busy to blog! Except for about 3-5 days scattered throughout the last sixty plus (60+) days, I have had a Zeal Wellness, Chia Seed & Lifeway Kefir shake every late morning or early lunch. I don’t really notice how much this product helps me keep going, but on those days when I don’t have it I start running down by lunch time, and I usually become useless by early evening. I would say the most significant symptoms I notice myself is how tired I feel and the foggy or spacey mind, I can’t seem to focus on anything and have no drive when the Zeal Wellness effect wears off. All I can say is, you really should go try Zeal Wellness. Order a 30 day container and try it, and then not use it for a few days, I guarantee you, withing 48 hours of not taking the product, you will go back to feeling run down the way you feel day to day before taking the Wellness Challenge. Alright, so here is day two, but before I get started, I wanted to comment on yesterday. Since I didn’t get my Wellness taken until later in the day, I only mixed up a partial serving, and it seemed to help a little, but I did notice as I was approaching 10pm, that I was running down and getting very sleepy, but I had not had enough sleep these last few days, so that may have contributed to that state. So this morning I made a cup of coffee and mixed up a full serving of Wellness, added the Kefir, and in addition I added a teaspoon of Greek yogurt. I had most of the Wellness shake after I sipped a little coffee to get me started, and then it took about an hour before I started feeling good. I didn’t really notice the Wellness taking effect on me, but all of a sudden I felt energetic enough to mop the master bedroom floors, get a load of laundry started, and complete my weekly unemployment claim. I was almost multitasking, something I am not very good at to begin with. So I would venture to say, the Wellness had a positive effect on me, and I will continue to use it and document my feeling and effects on me. So, I was working on my bills, minding my own business while the wife is resting because she isn’t feeling well, and the door bell rings. It was my mail person letting me know a package is at the door. To my delight, it is my Zurvita Zeal of Life Wellness order! Awesome. Since I was dragging today, I decided to get started. Because I could only afford the basic package, without the business consultant builders pack additions, I only got the 30 big container and 10 Sample bottles to give out, no hand mixing bottle or anything else. 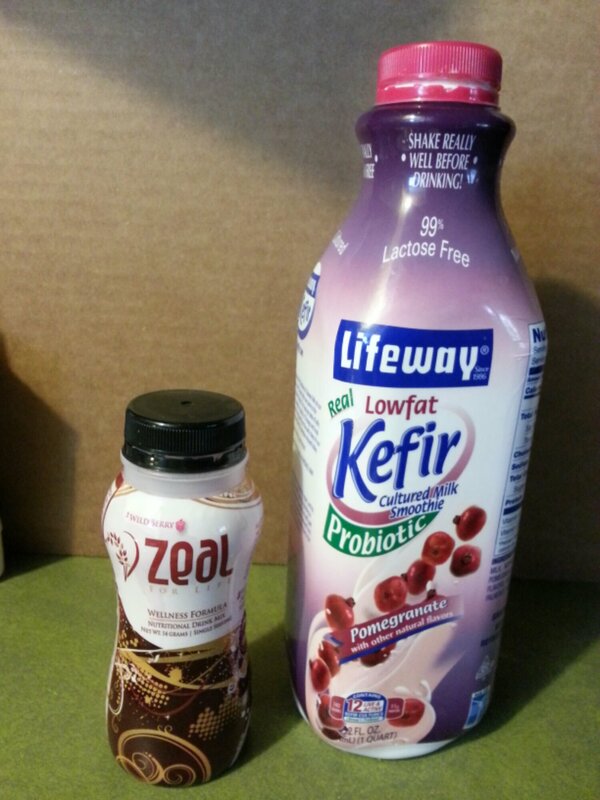 So I used one of the Wellness sample bottles I had saved when I was trialing it through my son, and put in a 2/3 scoop of the Wellness power, added water to the first bulge (about where the brown of the label ends), and after shaking it up really well, I topped the bottle off with some Lifeway Kefir, Pomegranate flavor, shook it up again, and started enjoying that while typing up this blog post. I had made this mixture before, and it turned out really good, and it did so today as well. So we will see how I feel a little later today, and over these next 30 days. Today then officially marks the beginning of my 30 day challenge, and I may extend it out to the full 90 day challenge if I can afford to order the protein mix in a month. About two weeks ago my older son invited my wife and I to a Zurvita Zeal of Life meetup at his place. I went there with the same attitude I have when dealing with MLM meetups. You know those Tupperware, Pampered Chef, Amway, Avon, and any other such MLM companies. So I sat through the video and personal presentations, run by the sponsor since this was my son’s first meetup. We heard about the sponsors testimonials, as well as the effect the Zeal products have had on my son and his wife. We got to sample both the Wellness and protein drinks, both of which tasted fine to my surprise since I feel most protein drinks taste like they have liquid cardboard in them. So, about 30-45 minutes later I walked out of there with 4 protein drinks and one Wellness sample bottle, free for me to try for a few days. I was skeptical about the products, but I was urged to give them a try anyway, and I figured this didn’t cost me anything except for under an hour of my time, and I have always wondered how I would feel drinking a protein drink daily like my wife does after she awakes. So I had a protein drink and half the Wellness the next morning, and repeated the next day. Then the following two days I had the remaining two protein shakes, but I didn’t really notice that much difference those four days, other than that I appeared to have a little more energy. On day five I noticed a major decline in my alertness and energy levels, and it got worse on day six, at which point I received four more bottles of the Zeal Wellness from my sons wife. I started back up by splitting one bottle over two days, and then a full bottle the following 3 days, and I was alert, energetic even more than on the protein drinks, and again, on day five without any Zeal I felt horrible. So, despite being unemployed and having a very tight budget, I broke down yesterday and ordered a 30 day supply of the Zeal Wellness, as I have had a difficult time focusing on hunting for a new job, or just dealing with everyday chores. I have to say, that I can improve my well-being a little by taking conventional vitamins and supplements, but it doesn’t give me the energy or focus like the Wellness does. So, as soon as I receive my 30 day supply, I will start documenting my progress of well being and once I find a job and can afford to do the 90 day weight loss and wellness challenge, I will do so, and document that as well. Anyway, I felt like I needed to document my findings so far, while I could still recall the details and time frames of my experience with Zeal so far. I shall report back as soon as I receive my supply and get going. So, I don’t think I have mentioned that back in early December that I was told one day to go home and wait for a call that never came when to come back in to work. I can’t really get into why I was told to go home, however, I can say that as of yet, they have not called me back, and I have not received a paycheck in close to 4 weeks now. I can tell you that the old adage that “money buys happiness” is not very true, just because you have money does not by extension make you happy, however, the reverse, the “lack of money causes unhappiness” is a fully true statement! I am currently experiencing the unhappy feeling of not having the funds to pay the bills on time, so I am increasingly becoming more and more depressed, which in turn is making me more and more unhappy. I MUST find a job, SOON! Limitations can be inspiring. At first, when there are restrictions and limitations on what we can do, it may seem oppressive. But in people like you, Moonchild, that barrier is often just what you need to break free. You are inspired by limits. A limit motivates you to tap into your deep well of creativity and move beyond the boundaries. You may now be facing a limit of some kind, but it won’t stop you. Once you get past the initial panic of dealing with it, your wild imagination will get to work. Reach for the stars. Well, no kidding, when you are told not to come to work, but that you are not laid off either, that is kind of a limitation, isn’t it? And yes, there is a panic stage I went through already – still am going through a little at this time. And yes, my imagination has been running wild – what can I do to make a living while I am job hunting? The limits and road blocks universe is throwing in my way are in fact inspiring me to look at many options for making a living, including this blog. Maybe I will never have the fortune to earn a living from this blog, but maybe a prospective employer might find my writing intriguing or inspiring? We shall see what universe throws my way next – more obstacles or some opportunities, maybe? Your relations with your mate won’t be devoid of turmoil; the discussions will be stormy, and neither you nor they will want to lose the privilege of uttering the last word; be the more intelligent of the two by speaking less and by listening more. This lunar climate may bring about money concerns or problems in your business. There’ll also be tensions in your professional relationships. The planets will give you a homebound mood and make you love domestic joys; it will be quite difficult to drag you out of your cozy cocoon and your slippers! Well, the wife and I have not really had any turmoil or problems, other than we’ve been sick with some sort of flue or something, but I have been doing more listening ans speaking, and due to us not feeling well, I have been in fact home bound and enjoying not stressing at work, although I have to say that I don’t feel stressed at work much, I have my days where I am glad to be at work and not at home. Working with like minded folks has its benefits intellectually and emotionally. I have not heard anything from work, so I continue to job hunt and hope for the best – in the mean time I keep working on this blog and other options, hunt on Monster.com, Craigslist and other resources for possible leads and try to keep my chin up as best I can. Were you in a certain group when you were in high school, Moonchild? Were you a “jock” – a sought-after athlete? Maybe you were the creative type – someone who others thought would be famous one day. Or perhaps you hung with the popular crowd – you knew everyone and everyone knew you. It’s also possible that you were a loner. Many Crabs are. That’s because your creative way of thinking isn’t always understood, and your shy personality is often mistaken for conceit. No matter which group you belonged to, you probably felt like a loner. You may still feel that way. But events of the coming weekend will show you just how much you are loved and admired. I do feel like a loner many days. Not so much being alone or lonely, but a loner in a world that doesn’t seem to understand the big picture, a civilization on the brink of change that is right in the face, but they don’t see it. I feel alone in a sea of people that seem to be ignorant to repeating history. I see loved ones and friends go through life not realizing they can help themselves to live a better future by studying history and avoiding the mistakes people have made in the past. I know I have loved ones all around me that love me and support me, but many of them don’t see the future either.